Does anyone remember these fantastic giveaways from Chivers Jellies in the 1970s? I remember saving up the labels for the fossil collection and getting my Mum to send for it. We only just made it and had one of the last ones. It took ages to arrive. They always said allow 28 days for delivery. Coin collecting was a classic hobby. But the shells, rocks and fossils were themes in tune with the era. After the scientific progress of the 1950s and 1960s, there was much more interest in the natural world. Of these Czechoslovakia, East Germany and Yugoslavia are no longer around. Formosa is Taiwan. The President of Formosa was Chiang Kai-shek. He used to claim that this tiny island was the Republic of China. Mao Tse Tung forced him out of power in 1948. The American Government refused to recognise Mao. So Chiang Kai-shek was able to get away with it. Shell collecting was trendy in the 1960s and 1970s. It was helped by Ursula Andress' character, Honey Rider, in the 1963 Bond film, Dr No. She collected shells in the infamous Crab Quay. The Chivers' collection included scallops and clams, as well as a turrietella snail. It was a tall spiral shaped shell. Chivers mentioned Eaton's at 16 Manette Street, London W1. It was a small shop specialising in sea shells. Fredrick Mayer founded the business in 1983 as the Eaton Bag Company. He sold his first shells in the 1950s and that became his main business. It still trades today, but online only. See www.eatonsseashells.co.uk for more information. 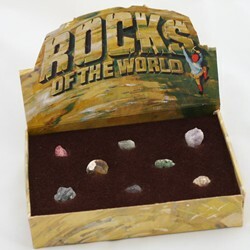 Also in 1972 Chivers offered a 'Rocks of the World' collection. Chivers based it on an idea by Miss Jennifer Deeley of Surbiton in Surrey. She was the first to write to Chivers suggesting the idea. Did it inspire anyone to study geology? I was into dinosaurs in the early 1970s. I thought this fossil collection was cool. My favourite was the fossil shark's tooth which was 25 million years old. The oldest was a bryozoa (moss animal) from Williamson County, Tennessee. It was an invertebrate sea creature that was 440 million years old. To get the fossil collection you needed to collect 18 stars from the Chivers' packs.